Presented by Nonsequitur & Earshot Jazz. The cultural threads connecting France, New Orleans, and New York are explored by this ensemble, featuring a new suite of music by 2013 Doris Duke Performing Artist Award recipient William Parker. The powerful and elastic duo of bassist Parker and drummer Hamid Drake teams up with the venerable New Orleans saxophonist Kidd Jordan and piano innovator François Tusques. Tusques was born in Paris in 1938, soon displaced by World War II. He took up the piano at age eighteen and learned mostly by ear, influenced by Bud Powell, Monk, and others, and, later, the American ex-pat free-jazz scene in Paris in the late 60s. He recorded one of the first albums of European improvised music – 1965’s Free Jazz – and played with a who’s-who of American icons of the avant-garde, including Anthony Braxton and Don Cherry. The modern American avant-garde exchanges in Paris, and other European cultural capitals at the time, stand as an important legacy for world culture and this country’s black music innovators. Then, the music grew as resistance in the context of heinous global forces of social injustices and discord. 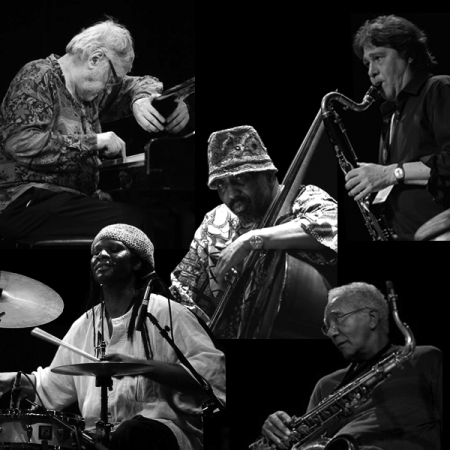 Today, these renowned improvisers join in performances as relevant now as the time of the music’s genesis.